For western diners, rice is something that fails to provoke much enthusiasm. It is little more than a filling side for foods that offer a greater degree of color or intrigue. This is in direct contrast to vast swathes of the Asian continent, where rice is considered to be an essential staple of daily meals. In fact, in most parts of India, China, and Indonesia, rice is a main ingredient in many recipes. Then again, you do not have to travel so far to find dishes that rely on this tasty commodity for flavor, bulkiness, and energy. You only have to look at European dishes like paella to realize its global value. It is arguably a lack of knowledge which stops diners in the west from fully appreciating the flavor and nutritional potential of properly cooked rice. If they were more clued up on the incredible flexibility and diversity of this marvelous foodstuff, perhaps they might take the time to prepare and cook it as Asian diners do – with care, attention to detail, and a respect for its unique structure. With everything from sticky Thai rice to basmati, sushi, paella, and congee varieties on offer, it can often be tricky to know what to cook and how to cook it, particularly if you are not used to dealing with rice on a regular basis. It is also true that rice can go wrong very easily, leaving amateur chefs with grains that are either too hard or too soft and mushy. The good news is that rice cookers are the ideal way for wannabe chefs to master perfect rice based dishes. This nifty little device is an invaluable kitchen aid because it regulates the environment in which the rice is cooked, meaning that moisture, water levels, heat, and steam are all rigorously controlled. For flawless rice, buy the best rice cooker that you can find and get to know its features. What features does the best rice cooker have? 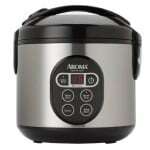 There are four main types of rice cooker available on the market. They are basic, refined, ultra, and automated. Their primary features are as follows. This is, as its name suggests, the most simple of all the commercial varieties available. It is also the cheapest, so it is a good choice for cooks who are interested in improving their rice dishes but do not eat them all that regularly. 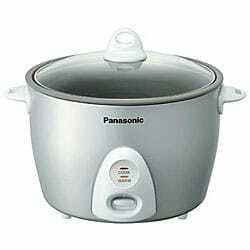 The basic rice cooker tends to feature a lift off glass or metal top, which can be removed from the machine. The only downside is that due to their cheap cost, they are usually constructed out of thin metal and this can make them very fragile. You must be careful when cleaning a basic rice cooker, so you do not cause damage. The majority of models are suitable for all kinds of rice, but should only be used to cook 2-5 cups a day, or they can break down quickly. The basic cheap rice cooker costs around $29. As for the refined variety, these models are positioned right at the center of the market. In other words, they are a little less costly than the premium rice cookers, but they are also more expensive than the basic versions. They are, in many ways, very similar to the basic variety, but they often come with a range of additional tools and features. For example, a pair of sturdy grip handles a detachable inner pot, a water catcher, and some optional cooking functions. The refined rice cooker is simple to use, will usually last for longer than a basic machine, and will likely be much easier to prepare, clean, and store away safely. The word ‘ultra’ is used to describe any rice cooking machine which features advanced technology. For instance, the popularity of things like magnetic induction and pressure cooking abilities is growing rapidly. These two cooking technologies offer a vastly increased degree of control and regulation over the consistency, taste, and color of rice varieties. You will often find that ultra rice cookers come with specially designed brown rice settings too. These are necessary for keen chefs who do not like the way in which regular white rice cookers handle brown rice varieties – some people believe that standard machines cannot cook brown rice properly. If you purchase an automated rice cooker, you will be given the chance to program the cooking process using a simple computer system. 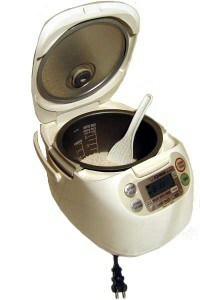 There are three key benefits to opting for an automated variety and they are as follows; better control over different kinds of rice (this is especially useful for dishes like sticky Thai rice and rice pudding), cooking times can be pre-regulated for maximum convenience, and the rice cooks faster leaving less chance for it to dry out or burn. The automated rice cooker tends to be the most expensive variety on the market because it does contain the most sophisticated technologies. However, depending on the model that you pick, you might find that it costs significantly less than the most advanced ultra-rice cookers available. 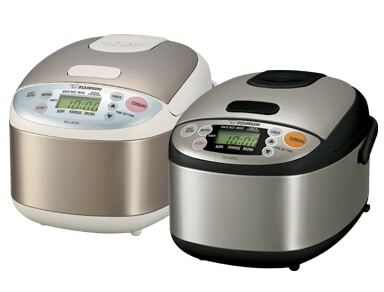 Selecting the rice cooker size that is best for you? If you want to make sure that you buy the best rice cooker available, it is a good idea to read a wide variety of rice cooker reviews and check that the models you are considering are suitable for your needs. For example, it is important to choose the right size of the rice cooker, or you are not guaranteed to get top quality dishes. The bottom line is that cooking tiny amounts of rice in a machine designed for much greater quantities will inevitably lead to rapid wear – you do not need to buy a large capacity cooker, if you are not planning to prepare and cook large amounts of rice. For households that cook rice on a semi-regular basis, it is always best to buy a smaller device and then just cook multiple times if it is ever needed. The most widely available rice cookers tend to be sold in 3, 5, and 10 cup varieties. The specifications detailed below should help you when it comes to the decision to buy a rice cooker online. In this case, the word ‘cup’ does not refer to a standard glass or mug, but a standardized measure included with all commercial rice cooking devices. 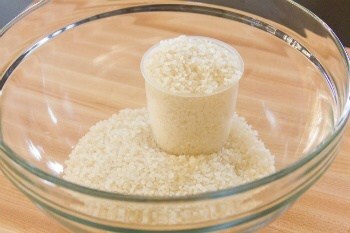 The 3 cup small rice cooker can handle a maximum of 3 cups of raw rice, which is equivalent to 6 cups of prepared rice (this is how much edible rice the machine will make). This quantity is enough to feed approximately 4-5 diners. It is the most suitable option for small households that only eat rice once a day or even less frequently. The 5 cup cooker can handle a maximum of 5 cups of raw rice, which is equivalent to 10 cups of prepared rice. This quantity is enough to feed approximately 6-7 diners. It is the most suitable option for households that regularly eat rice more than once a day. If you are one of these households, it could be more efficient to pick up a machine with a warming function, to reduce cooking time. The 10 cup cooker can handle a maximum of 10 cups of raw rice, which is equivalent to 20 cups of prepared rice. This quantity is enough to feed approximately 12-15 diners. As this is a huge quantity of food, 10 cup cookers are usually reserved for commercial kitchens, professional chefs, and huge households. It is important to know that the Japanese and US cup measurements are not always the same. While the ‘cup’ that comes with a Japanese rice cookers are usually around 200 ml; the US ‘Cup’ is more likely to measure around 240 ml. The best way to make sure that you always cook the right amount is to simply keep using the measurement cup that comes with your rice cooker. You should only throw this cup away if you buy a new machine that comes with its measuring device. On the whole, there is no massive deviation in materials when it comes to standard rice cookers. This means that you will not get confused or bewildered when confronted with a hundred different options online or in store. You should not have to dedicate much time on considering the materials that your cooker or rice steamer is made of because the only significant difference is ease of cleaning. For example, the cheaper varieties (like the basic model) can be a little trickier to clean because they are made out of thin metals that are prone to damage and breakage. On the other hand, the more sophisticated machines are usually made out of higher quality materials (charcoal and clay) and can be washed, transported, and stored with ease. They also tend to come with non-stick properties. Should you be looking for a rice cooker with extra features? While the available materials may be few (there are only a handful of materials which are capable of cooking rice in this manner), the scope and range of additional tools and features can be massive. It should come as no surprise to find that the more you are willing to spend, the more innovative and advanced features you can get your hands on. The following features can be found on many of the premium rice cookers available on the market. Measuring Lines – these subtle little measurement indicators can be extremely useful for cooks who do not like being dependent on ‘cup’ based devices. If you have lost the cup that came with your cooker, for example, it would not matter if the machine had its measuring lines. These indicators are usually found on the interior pot and help cooks to make sure that rice is properly prepared. Steam Vents – if you can afford to purchase a rice cooker with steam vents, you are advised to opt for a variety of this kind. One of the most frequent mistakes made with rice is putting too much water into the pot for boiling, but with the help of a steam vent, excess moisture is allowed to escape and your rice will not emerge all mushy and shapeless. Warming Function – this is a handy feature for households which eat rice on a regular basis (often more than once a day), because it means that the machine does not have to cook the food from scratch every time it is needed for a meal. However, only most costly machines will keep rice at a safe temperature for longer than six hours, so do consider this before you purchase one. Reheat Cycle – fortunately, there is an easy answer to the dilemma posed by this relatively short warming duration. You can simply purchase a slow rice cooker that has a reheat cycle. This means that it is able to reheat safely rice that has already been cooked and refrigerated. It is imperative that you only do this with a machine that has a proper reheat function, or you could give yourself a severe stomach upset. Clear Removable Lid – this feature is found on many a stainless steel rice cooker and is great for amateur chefs who like to keep an eye on the cooking process at all times. In other words, if the lid is transparent, you can visually monitor the rice as it approaches the correct density and firmness. However, if you simply purchase an automated machine, there will never be any real need for this. What brands should you be considering? If you are looking for advice on the best rice cookers available on the mark et, the Aroma Rice Cooker ARC-914SBD and ARC-150SB and the Panasonic Rice Cooker are three of the finest. The Panasonic Rice Cooker is one of the most popular choices around right now because it features patented Fuzzy Logic technology. According to the manufacturer, it guarantees perfect rice every time. The Zojirushi NS-LAC05XT and the Zojirushi NS-TSC10 5-1/2 Cup Rice Cooker are two more models that are great for households that consume rice on a regular basis (more than once a day). The Zojirushi rice cooker models feature some of the most advanced warmings and reheating capabilities, so opt for this brand if you know that you are going to be preparing and cooking large quantities of rice.